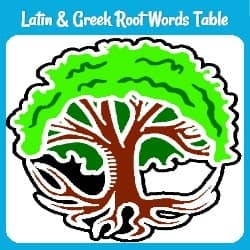 Much of our English ‘sense vocabulary’ comes from Latin roots (via French), although our most common words (seeing, hearing, smelling, tasting, etc.) have Anglo-Saxon roots. Aspect, circumspect, inspect, inspection, inspector, perspective, prospect, prospective, prospector, spectacle, spectacles, spectacular, spectacularly, spectator, suspect, suspicion, suspicious. Audible, audience, audio, audiology, audition, auditorium, auditory, inaudible. Attain, attainable, contact, intact, intangible, tactile, tangible, unattainable. (Intct and intangible are both negatives, but 'intact' means untouched-- undamaged. Intangible means something we cannot 'touch' with the senses-- something that is not physical, but intellectual, moral, spiritual, etc. Common related words: insensitive, sense, sensation, sensational, sensibility, sensible, sensitive, sensitivity, sensor, sensory, sensual, sensuality, unsensational. Sensible originally meant capable of feeling, but over time that changed to ‘reasonable’, even ‘wise.' It is now a false cognate of the Spanish ‘sensible,’ which has kept the meaning of ‘sensitive’ or ‘perceptive.’ ‘Sensibility’ has also kept that sense. So has 'insensible,' which means unconscious, unaware, or even incapable of sensation. So someone who is sensitive reacts easily or strongly to what she or he feels or senses and may be easily hurt or easily moved by the suffering of others. A sensible person usually doesn't react as quickly. 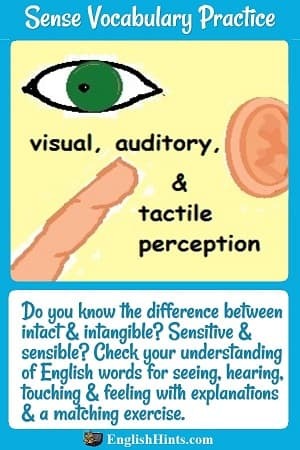 More commonly as a prefix ‘in’ (or ‘im’ before an ‘m’ or a ‘p’) means ‘not’: improvident (not careful to provide for the future), improvise (to make adjustments for unforeseen, unexpected events), inaudible, insensitive, intact (untouched or undamaged), intangible, invisible. Match the words on the right to the sentences on the left. The first one is done for you. > Roots, Prefixes, and Suffixes> Sense Vocabulary.